Kit preview of Revell's 1/24 Gemini Spacecraft. Instructions: Foldout pictorial/text, with paint call outs. Molding Quality: 8 - little flash, few ejector pin marks. Overall Rating: 9 - nice, big, easy-to-build kit with plenty room for the serious detailer. The Gemini program was the intermediate step between America's first steps into space and the moon landings. Twelve spacecraft were launched netween April 1964 and November 1966, all but two of them manned. ^ All the parts are nicely molded. ^ The New Ware set provides many more markings, primarily the small stenciling and warnings. These are certainly useable, however. ^ The instructions are reprints of the originals. They're far better than most of what one finds in today's kits. The first astronauts to actually maneuver their craft in space were aboard Gemini 3; the first American space walk occurred during Gemini 4. Docking maneuvers and longer EVAs were part of later flights, all intended to gear the US astronauts up for landing on the moon. 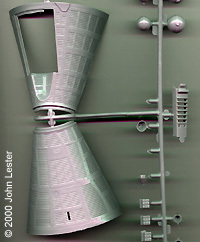 Revell's 1/24 scale kit is probably the best-selling factual space craft model ever, at least up until now. It's fairly well detailed, fairly accurate, and big. It has been reissued many times over the years. Despite it's age (the copyright on my kit says 1980, but I know it was around prior to that), it holds up well against other, newer mainstream space and sci-fi models. The now-standard flimsy clamshell box sports vintage artwork - misleading artwork at that, since it shows an astronaut on an EVA tether that is not included in the kit. Inside the box are nearly sixty grey styrene parts, plus four clear ones for the windows. Molding is crisp, despite the age of the molds. Detail consists mainly of raised lines, which is accurate for the exterior ribbing at least. Comprehensive, and easy-to-follow instructions and a small decal sheet round out the package. Is it accurate? Well, yes and no. The original kit was a faithful reproduction of a pre-production mock-up. Most of the equipment and systems carried by the flight vehicles are present on the model, though not all. The paint guide, which consists of call-outs interspersed with each construction step, is similiarly accurate. In other words, it faithfully duplicates the colors of the mock-up, which were brighter and had more contrast than the flight vehicles carried. Note that the flight vehicles carried a gold shroud to protect the equipment in the Adapter Section - if you replicate that, you won't see any of the equipment back there and it won't matter if it's painted. 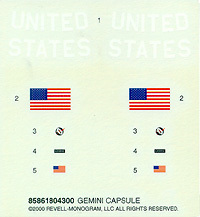 Space in Miniature #2: Gemini monograph, which contains comprehensive instructions for modeling any of the 12 missions. RealSpace Models' accurizing set, which contains resin parts to correct certain panels and add sensors. 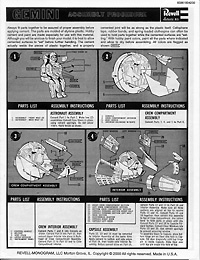 New Ware's decal sheet, which contains many more markings than the generic set provided with the kit. If my fuzzy memory serves, the original kit included the landing legs that mock-up carried (at one point, missions were supposed to return to Earth using a parasail - Rogallo wing - and land on dry land. This concept was rather quickly abandonned in favor of water recovery). Sometime later, the molds must have been corrected, as I see no evidence of the landing gear in this kit. I may be thinking of the 1/48 scale kit included in the latest Gus Grissom Memorial Combo - anyway, it's a neat idea for a "what-if" display. Given the items suggested above will set one back nearly $60 USD, is the kit worth it? I'd say yes - even without them, it builds up into a nice, fairly accurate display model. It could well be a weekend project, just the thing to get a modeler jaded by ill-fitting, hard-to-build models fired up again. I'd recommended it for anyone who has built a glue kit before. Many thanks to my long-suffering wallet for providing the review sample. Manufacturers and retailers, interested in getting your wares reviewed and publicized on a site averaging 2000+ readers a day? Contact us! This page copyright © 2000 Starship Modeler. Last updated on 27 May 2000.